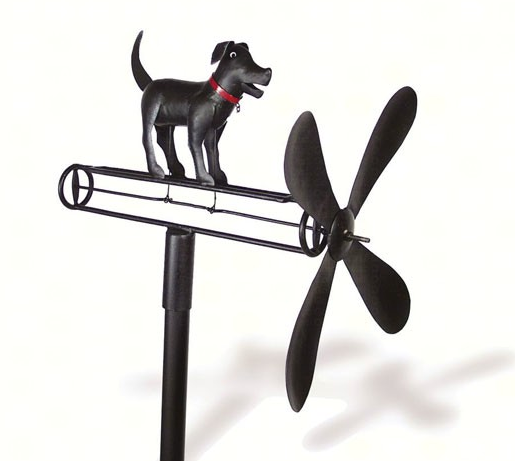 This happy and playful black lab whirligig comes to life when the wind blows. When the wind blows watch the whirligig in action as the black lab will wag its tail and move its mouth. This wind-powered kinetic sculpture for the garden is made of metal.This whirligig is a charming ornamental piece for your yard or garden and will jazz up any spot you decide to place it! To retain the finish we recommend periodic application of a sealer such as clear polyurethane otherwise if left outside will oxidize naturally. Artisan crafted Slight variations in color and shape are the nature of handcrafted crafts Lubricate moving parts!